Now, being new to this group, and possibly the only member who is not an astronomer, engineer, mathematician or scientist, I have a lot to learn about the skies. I’d really never thought very much about the dangers incumbent in the inability to determine a ship’s location when at sea. In figuring out the east-west position (longitude), ships gained the ability to navigate the waters, lessening the chance of being lost at sea. But how to calculate longitude on a moving vessel in the middle of open ocean waters was a conundrum that took centuries to solve. There were many untried ideas. The 1714 Longitude Act offered a large sum of money to solve the problem. Even then, it took another half a century for the Board of Longitude to hold sea trials to test the most promising ideas: John Harrison’s H4 timekeeper and Tobias Mayer’s lunar tables. A marine chair for observing Jupiter’s moons was subsequently deemed ineffective. This special exhibit displays art work, rare timekeepers and instruments to tell the story of the quest for longitude. This is complemented by a special planetarium program following Captain James Cook’s voyage in which he and his crew tested the longitude solutions in the Pacific Ocean. I’ve hardly touched upon the amazing opportunities for learning and the hands-on experiences offered by this living history site. Hopefully, if people are interested, the links provided will help to give a better feel for Connecticut’s Mystic Seaport. Oh, and a side trip to Olde Mystic Village is highly suggested. I’ll write about the small New England villages I love to visit some time in the future. It’s certainly worth a share. You’re very welcome and Happy Holidays to you, Jacqueline! Well done on joining a very worthwhile club, Clare. What a great exhibit. Yes, every time I go to Mystic, I learn something new. And now, they are going to be keeping the seaport open year-round. Thank you, Yvette. Hello Claremary, Just went out to get the newspapers off of the driveway and spent a few minutes contemplating how bright the stars still are this morning. Then, I come in, turn on my computer and up pops this posting on Mystic Seaport! This was such an interesting post! Thank you for sharing all of this info. 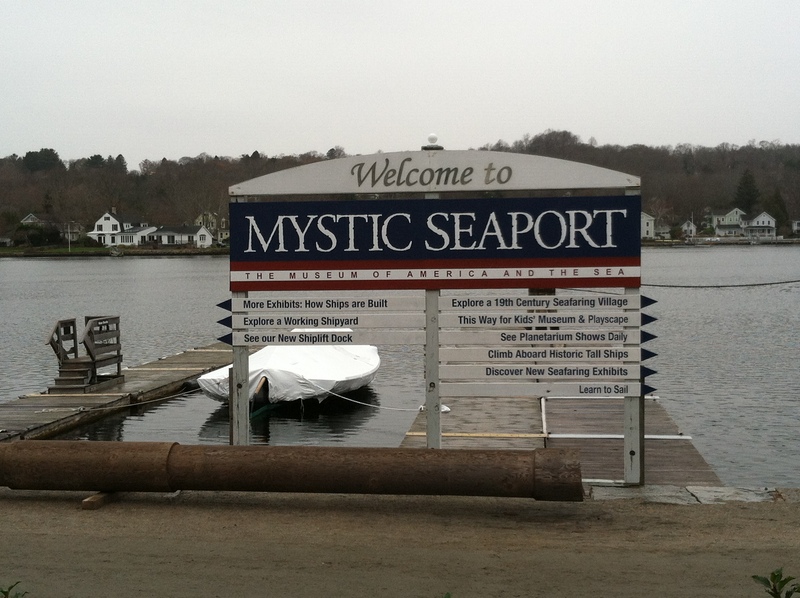 It has been at least 30 years since we have been up to Mystic – we are way overdue for another trip. You have been so good about keeping your blog going – I am impressed!! 🙂 My New Year’s Resolution is….yeah, yeah. I would like to think I would keep at it, like you! Merry Christmas! I’m really much more aware of the skies now that I’ve looked through a telescope and had the moon’s craters right at my fingertips . It looks like they are going to try to keep the seaport open all year long because they now have many more exhibits and programs than in the past. And they are in the process of building a huge exhibition hall for all of the artifacts that have been accumulating in the storehouse across the street. I think a trip would be in order for you after 30 years. I was just sitting listening to my mother talking about her trips to New England and she got to remembering this very place. And now here you are talking about it. I love the way life does that …. On another note, I am well versed in being the only one not up to speed in the maths and science of the skies and tend to smoke-screen myself with a smattering of poetry to distract in these situations! How really cool is that! Give your mom a big hug from me. Such a small world. Does she have any relatives left here in New England? I had a vacation home in Bretton Woods, New Hampshire, across from the Mt. Washington Hotel. I’ll do a post on that beautiful part of New England sometime in the future. I hope she’ll have some fond memories when she reads it. I have so many older “followers” here in RI who do not even own a computer. I print out the posts for them (Large print) or read it aloud. They like that better than signing in on the internet, so there is no motivation to get them on line. They also love me to read the ZuZu stories aloud to them. I get to do the different characters and am particularly good with the voice of ZuZu’s Mama. I may even do the stories on You Tube some time in the future. You never know.Take care. I will be buying a copy of ZuZu’s book for her whilst I am over next time …. I know she will adore it. She has no relatives left in New England now. In fact her brother laterly lived near my cousin in Ohio my other cousins live in Maryland and Northern California so for her discovering a link to the past that she loved and the brother she adored is really precious. I love reading aloud by the way …. and your stories are made for it! A marine chair for observing Jupiter’s moon… I guess it made sense then…. Problem was they couldn’t get the chair to remain stationary because of the waves and the ship’s movement. It was the weakest of the 3 final ideas. The other 2 ideas are still used today and some of the reward money went to them. Not yet. Unseasonably warm right now, but winter is here in 2 days. Then, anything can happen here in RI. A golfer’s dream is to play Pebble Beach here… They play the ATT pro-am in pouring rain..
We were at Pebble last spring and Charley was in heaven. I liked the Monterey Aquarium and could have stayed there for the entire vacation! So much to see! I love this because it is a learning experience that I would not otherwise be exposed to. Plus you did a marvelous job of putting it together. thanks for taking us along on this amazing tour! I love the slide show and pictures! You sure have been to so many interesting places full of history and new info. for me! I love history! Thank you for sharing Clare. This was so fascinating to read! You’re welcome. Yes, I love history, too. It’s one of the things that makes bogging so interesting. I learn so much about people and places from other blogs,like yours. I can travel from RI to Australia, to Saudi Arabia, To Florida, to Idaho, to Paris, to the Cotswolds, and on and on, all in one evening! Unbelievably amazing! PS Just visited Flem…Still laughing! She is funny! I am glad you are enjoying it! She’s a hoot! I want her in my family! I’ve always been fascinated by the history of sea travel and navigation. In the very early days, navigation depended so much on the stars and other ‘heavenly bodies’. I’m not into astronomy, either, but your post was very interesting and informative. I enjoyed reading about the Longitude Act and Captain Cook. Great museum – and thank you for sharing. You’re welcome, Millie. There was so much information – overload! So, I just summarized the high points and put in links if anyone wants more information. And it still took me two posts! All of this astronomy is new to me and I find it really interesting.I guess there’ll be more posts about the heavens. That sounds like something worth doing. I love informative posts, Clare, especially when they’re about things I know little about. I enjoyed this post a lot. I think it’s graet to have a really versatile blog, but we all have to start somewhere. All I did to start with were posts I thought fitted in with either history or writing – because I write historical fiction. Like you, I’ve added other types of post throughout the year, and I still have a few ideas for more. I find reading people’s posts really interesting as well as very educational. I love your posts, and I’m fascinated by New England and its history. I need to ease off my blogging after my next few posts to devote some time to my book, but I’ll try to post once a week and visit blogs as well. When I took Word Press Blogging 101, we posted every day for 3 weeks and that was ok because I was bent on learning and I was not writing at the time. But now I can just about get out a blog a week. I don’t know how daily bloggers do it! Many of the people I follow are writing, too and taking time off. So, if it comes to that, I’m sure bloggers will be patient and waiting when we return. That’s what I’m hoping, Clare. I would hate to lose touch with everyone I’ve talked to throughout last year. I could never post every day either. But many of the people who do that, write much shorter posts than you or I do. As you know, Travel posts take a while to construct, and my Customs and Traditions posts do, too. I think one post a week should be OK for a while. Agreed. And you know i’ll always be there for you. Kind of like Greyfriar’s Bobby except you’ll be alive and well and writing best sellers! Best sellers – ha ha! I think that’s a dream all writers have. It’s a nice one, though, and helps to motivate us into writing as well as we possibly can. It’s all such a learning process, this writing business. I just wish I’d started years ago. It’s so nice to know we have friends in various parts of the world. I’ve loved talking to you, Clare, and feel sure we’d get along brilliantly, should we ever meet. And I love the story of the loyal little dog, Greyfriar’s Bobby. You can count on me to always be yours, too. I wrote a post early on in my blog about my first reading experience with 1st graders. It’s called “Guess How old I Am?” I wish I’d started earlier, too but I was just too busy correcting other people’s writings. I’m really enjoying it now. I woke up at 3AM and came downstairs to a very productive writing session. Three chapters and over 3,000 words. I re-read the chapters and really like them. Now, I’m taking a break, as you can tell. It’s 7:10 AM and I really need one. So, here I am. It’s nice that someone else is awake to chat. It’s even nicer that it’s you. Thanks, Clare. I won’t take up your time with idle chat, but it’s nice to know your writing’s coming on so well, even if it is done at 3 am! It’s 12:20 pm here now, and I’m about to go and do some cooking. I think you probably need a nap, or you’ll be needing some matchsticks for your eyes! Whoa! Work and 6 children. How did you survive? It’s now 11:35 AM. I took a nap and am now heading back to writing another chapter or two. I really have a hard time sleeping when I’m in the middle of writing something. My thoughts just keep going in my sleep and I end up waking up and writing. I’ll go to sleep at 1 AM and wake up at 3AM! I’m used to it by now. Oh, and I adore idle chatter at any time of the day or night. Especially with you, Millie. Well that’s alright, then. I love idle chatter with you, too. :D I know exactly what you mean about insomnia when you’re in the middle of writing. If you have one of those minds that just won’t switch off, it can be very hard to get any sleep at all. At least when you’re retired, you can always nod off during the daytime. Look after your health, Clare – lots of years of happy writing ahead! Millie, I took some time to follow the link in your post to your daughter’s blog. It’s magical! Thank you for doing that, Clare. Louise loves fantasy, and she does a lot of ‘arty’ things for children. But she adores history – her degree was Medieval and Classical Studies. She’s written a fantasy novel during NaNoWriMo and is editing it at the moment. It’s seems to be ‘all go’ on the writing front with everyone at the moment! I enjoyed her blog and will certainly return. I particularly loved the pictures of the children with face paint. Louise has worked with young children and even went into teaching for a while. Face painting is something she loves to do. Thanks for the nice comments about her. We’ll talk about book launches when the time comes. Keep writing!